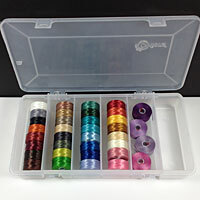 36 bobbins of C-Lon Bead Thread Size D nested in one 6 compartment bobbin box. 4 compartments are full, 1 has 4 bobbins and could house 4 extra ones. The last compartment is free to hold extras bobbins, needles or anything you may want to store. Holds up to 48 C-Lon Bead Thread Size D bobbins in 6 slots. Made in the USA - Bobbins not included! 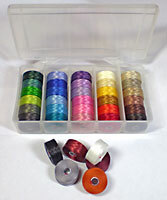 Holds up to 30 C-Lon Bead Thread Size D bobbins in 5 slots. More notes - When looking for an alternative to silk for double half hitching, I found it behaves like a silk floss, with the advantages of lower cost and better stain resistance. 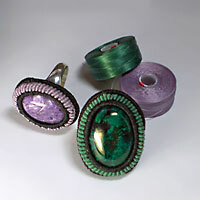 I would recommend its use for Cavandoli style knotting over C-Lon Bead Cord or Nylon #18. In solid double half hitches knotting it works well as the knotting cord only, not as the anchor cord. In the cabochon rings posted here, I used it doubled or tripled and may have done one or two rows of vertical double half hitches as shown on the rings shown in the photo above. Beeswax - Additionally you may want to pre-wax the thread with beeswax. It makes the thread longer lasting and easier to work with. 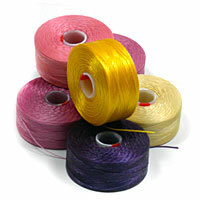 Unlike hybrid cable beading thread, C-Lon Bead Thread is soft and flexible. It can be used with sharp edge beads such as Swarovski crystals as long as the heaviest weight thread is used and the work is reinforced by passing through the beads several times. Of course if the bead edges are too rough, beadind thread or cord are not recommended unless the edges are first smoothed out with e bead reamer.